Tuesday 16th - Today after a very healthy breakfast, we set off from Graz heading for a village called Villach (Pronounced Villag) very confusing I know, where we were to meet up with Simon Huddard who was coming down from Wales on his way to Graz. We are due to visit the Hospital in Cardiff on the 25th June, so we plan on having a quick chat to make final arrangements. Anyway we set off in good spirits under a clear sky. We were looking forward to another day in the saddle. Remember we had not been doing much riding these past few days having been at Erdsberg over the week end. It had rained during the night so we were taking it fairly easy early on in the ride because the roads up in the hills and in the forests were still a little wet. 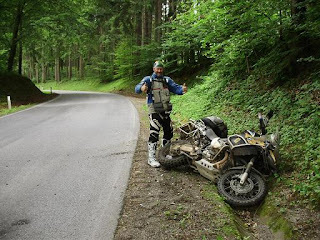 I was leading the group and going through this forested section up in the mountains and geared down to go into an off camber corner, the next instant the front wheel washed out from under me and I was sliding down the road on my backside. While I was sliding time seemed to stand still. I could hear this terrible sound of the bike and metal panniers screeching as it slid across the tar. As I slid I was looking up and watching the bike sliding off down the road and I remember clearly thinking that as long as the bike or I don’t hit something we will be ok. Well the bike slid of the road and into a ditch and I followed just missing a concrete km marker at the side of the road. 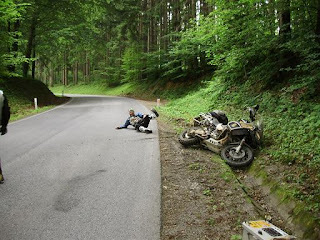 Thankfully our momentum by then had slowed so as the bike went into the ditch it flipped over and came to rest on its side. I got up and dusting myself off I checked myself over for injuries or scratches, nothing I was able to walk away from this one unscathed. This was testimony to having the right gear on when riding. 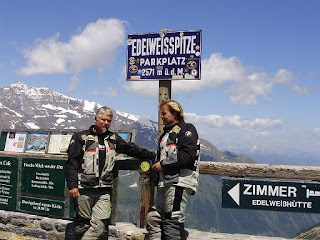 All the funny looks we have been getting along the way when we walk into a place wearing Big boots, Rider pants and these heavy BMW Enduro Jackets counted for nothing at that point. If I had been riding with anything less on I would have been spending the next hour or so covering myself in bandages and mercurochrome. Walking over to the bike I was expecting the worst. Thanks to the strength of the Metal Mule panniers and of the bike, the damage was very minimal. The panniers were scratched but not broken and the screen was bent also not broken, Very very lucky indeed. With help from Jaco and Howard we got the bike out of the ditch and after straightening everything out, and Howard taking a few pics with me re-enacting the crash. No not literally, was not going to do that again no matter how good mates we are. We then carried on our way, a bit more cautiously this time. Square cornering was the order of the day from then on. I must just add here that last night Jaco and I had just been talking about the trip so far and how lucky we had been that no one had any crashers, I said that we must be extra careful from here on in. The trip is almost over and this is the time when one normally starts to relax and let ones guard down. Point proven!!! Arriving in Villach we headed for a street Café to wait for Simon. Once again our bikes attracted a lot of attention and within no time we had a crowd of people gathered around taking pics and asking us about our trip. The one big difference was that, unlike some of the places where we stopped in Africa we did not have to keep swatting hands away that were trying to help themselves to our kit. Simon arrived soon after us and over a cup of coffee we chatted about our Wales arrival. 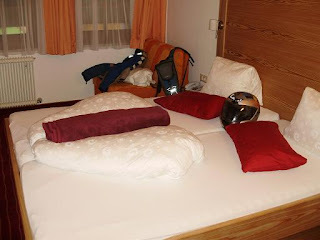 Simon also suggested that we from here take a ride up to a place called Hinterhal where there is a hotel called Hotel Simonhof. 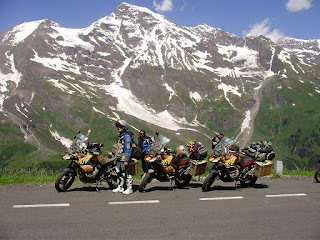 A very biker friendly hotel, and it is situated at the start to the Grossglockner Mountains and a mountain pass that “Top Gear” rated the best biker road in the world. 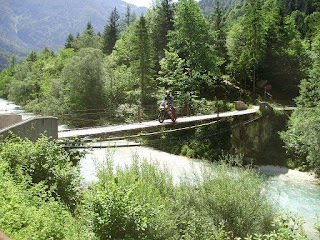 Well no second thoughts, we had to do this pass, saying our goodbyes to Simon and having made arrangements to meet him on Saturday we made ready to leave for Hinterhal, about two hours ride from here. 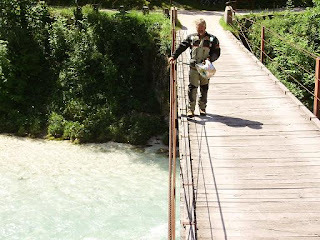 Arriving at Simonhof we were welcomed by the owners and shown to our rooms. What a surprise this was. Having been used to camping for most of the way or when we had stayed in a “Hotel” in Africa it was the norm to first ask if they had water and electricity. Which nine times out of ten they did not. And we were not always sure what creatures were going to be sharing the beds with us. Walking into this room was a total opposite, the beds had duvets that had been folded back into a shape of a heart, Chocolate on the pillow and the lights come on automatically as you walk in the room. And to top all of there’s hot and cold water in the shower. After dinner we headed of to bed, not before watching another fantastic sun set with the sun going down over the Alps. Wednesday 17th - We had arranged to meet Jochen Saur, the head of KTM marketing at Mettaghofen, the home of the KTM motorcycle factory. And this is also where the M in KTM comes from. 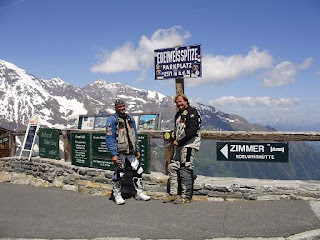 We have now learned that KTM does not stand for “Kick Till Monday” (And to all you KTM riders I say this with absolute tongue in cheek) KTM actually stands for… “Kronreif Trunkenpolz Mattaghofen” I apologize for the bad spelling and pronunciation. We headed of to the KTM factory at 8:30 knowing that we had a two and half hour ride ahead of us. We were due to meet Jochen at the factory at 11:30, so we knew we were ok for time. Arriving at the factory with half an hour to spare we were told that Jochem was still out with a group of Japanese journalists but we should wait and he would arrive shortly. Well shortly turned out to be an hour and a half later. When Jochen arrived we were given something to eat and along with the journalists welcomed to the factory and first given an overview of KTM and their policies and vision. They are putting a lot of time and money into developing the product and of course the racing projects. After the introduction we were given a tour of the factory and it was really fantastic to see the bikes coming together from the birth of the bike. Where it is nothing but a frame and a million parts, to the final product that comes of the test bench and is ready to be shipped out to Alfie, and the other dealers around the world. We were very fortunate to be allowed into the Research and Development section. (This area is normally restricted to public) we were asked not to take pictures or to look too closely to the bikes that are in this area. All I can say is that KTM have some very interesting and exciting bikes coming out soon. We were also shown the Rally Bikes and the work that goes into producing the bike and getting them ready to take part in the Dakar. 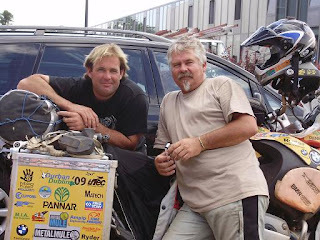 Unfortunately it seems as though the Dakar may be a thing of the past for the 690 and 640’s. There is a move afoot by the Japanese manufactories to get a limit imposed on the size bikes that enter to a max of 450. Last year may have been the last time we have seen Cyril and Marc Coma battling for line honors on there big KTM’s. After the visit we headed back to Simonhof and once again an early night’s sleep. 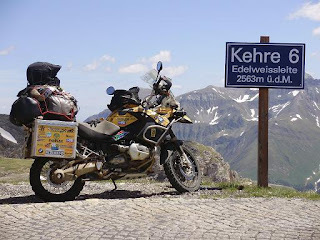 Thursday 18th - We woke up to a beautiful clear day and after breakfast loaded our bikes and set of to ride the Grossglokner mountain pass. 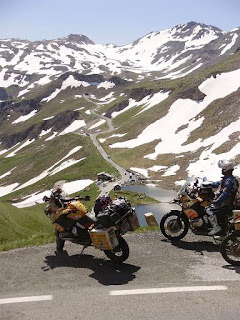 If there is one thing that you as a biker have to do in your life and that is come and ride this pass. It is a good tar road twisting and climbing its way up the the snow capped mountains to an altitude of 2750 meters. Sani I think is 1340 meters. Gives you some idea on how high you go. Along the way we stopped often to take in the view and take photos. At one of these stops I commented to Howard about the ride and view. He looked at me and said he is covered in goose bumps, not from the cold, but because of the magnificence of the whole place. AWESOME!!! After getting to the top we started down the other side stopping at a Glazier along the way, one can clearly see the effect of global warming here, the glazier has halved in the last 10 years. Arriving back at Villach late in the afternoon we made our way to the Hotel Mosser, which is a situated in the centre of town just around the corner from the river. Meeting the owner, Tina and her assistant Anita we were made to feel really welcome. Booking in and putting our gear down Anita invited us to join them for dinner at a restaurant in Town. After cleaning up and changing into clean clothes we headed of to the restaurant to meet up with Anita, Christian (Anita’s husband) Alex (her son) and Tina. We were treated to a very good meal and literally had a ball. At the end of the evening we asked for the bill and were told in no uncertain terms that we do not pay for anything. We are their guests. Guy’s you have been amazing and your hospitality goes beyond words. Friday 19th - Last night Christian told us about a good day ride into Slovinia the neighboring country, so we decided that because we had a bit of time to kill we would do this. Poor Howard and Jaco were really tired today. Not sure if it was the meat they had for dinner or maybe the Schnapps we had tried. But being the tough guys that they are, and not wanting to miss the opportunity to see a new country they agreed that we do the ride. Riding up into the Slovinian mountains and along these mountain pass roads that were built during the Second World War when the Germans were fighting the Italians. We were once again really enjoying the beautiful scenery. We stopped for lunch at a small restaurant up in the hills on the side of the road and enjoyed freshly caught trout with a coke to wash it down. 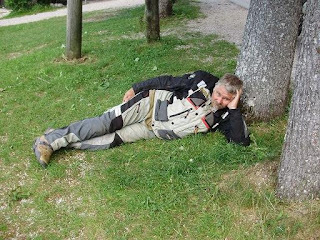 By this time the two guys were really battling to stay awake, so a few km’s down the road we pulled over at a mountain lake to get an hours rest under a tree. I need to add here the water up in these mountains in the rivers and lakes are and amazing clear color, I kept looking for the person that was pouring the HTH into the water. The color is an ice blue and looking at the water one can see the fish and bottom clearly. The water comes down from the mountains where the snow and ice is melting and the result is this clear but very cold water. After taking a short nap we set of for the hotel, putting the co ordinates for shortest route home into the GPS we set off. What I didn’t tell the guy’s was that section of Slovinia was not loaded as a map on my GPS, so I had absolutely no idea where we were going. Following the few sign boards of towns I remembered having seen on the map before we left this morning. We eventually got back. Sorry Howard and Jaco, but we actually did 80 km’s more than we should have. When we got back we were invited to Christian and Anita’s house for dinner. Howard opted to stay and get some sleep. So Jaco and I went of to join our hosts at their very modern and beautiful home for dinner. Also there was Kurt (Jackie) a friend of theirs and an avid hunter. Jaco and Kurt spent the evening planning African hunting safaris for Kurt and Mountain Goat hunting in the Alps for Jaco. After a most enjoyable evening we made our way back to the hotel for some well needed sleep. Saturday 20th - Woke this morning to a very wet and miserable morning. We have made a decision to spend the day at the hotel getting a bit of rest and hope the weather will start to clear tomorrow. Tomorrow we start the final stages of our travels to Dublin. Not before seeing a bit more of Austria then into France for the ride down into Calais for our ferry crossing into Dover. From there we head up to Wales (Cardiff) where we are due to visit the hospital on Thursday. We are due to arrive in Dublin, Ireland on Tuesday the 30th where we are looking forward to some good Irish hospitality. The pictures are amazing. Lovely views! So glad you guys are still well. Keep on keeping on. Good luck, stay safe. Well done guys and keep it up. Wish we were there!! Well done guys, an unforgettable experience you will have together forever. Can't wait to read the book Howard!!! !